Last Sunday, I preached a sermon that presented my current understanding of John 15:18 through 16:4. This passage follows closely on Jesus' words that he is the vine and we are the branches. The last part of John 15 points out that the vine does not exist to make a wonderful life for the branches. In fact, branches that get in the way of the production of fruit are pruned away. The goal is that the vine and the branches work in concert to produce fruit. Fruit can be defined as love, joy, peace, patience, understanding, kindness, goodness, faithfulness, gentleness, and self-control (as in Galatians 5:22, 23). It must also be defined as justice for others (as in Isaiah 5:7) and as the growth of more fruit-producing branches (Matthew 28:19, 20). In the church, this latter definition of fruit means more disciples of Jesus. The obstacles to the way of life that produces fruit of the Community of God are many; but the primary one is our western addiction to consumption and caring for our own wants. In Bad Religion: How We Became a Nation of Heretics, Ross Douthat speaks of the pastor of Lakewood Church in Houston, Texas, the largest congregation in the United States, and says that he preaches "an upbeat gospel where 'God gives without demanding, forgives without threatening to judge, and hands out His rewards in this life rather than the next'." God, please give us resurrection. Give us second-birth. Bear with us long enough that we might grow fruit before you prune us away from the vine. Flannery O'Connor wrote these words as our culture was just beginning to move to a greater degree of determinism. She died in 1964 and The Habit of Being was published in 1979. Even pretentious prayers would be gone. Robert Burns was a self-indulgent man who drank too much and fathered children with several women. He had many of the character flaws of a contemporary rock star. He was also a brilliant writer of poetry and song. One of my favourites is still "To A Mouse." Here it is in its original form. An English translation follows. The final stanza subtly reminds us that mice and men must live with their eye on the present. 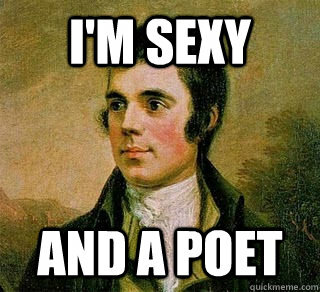 Happy Robert Burns Day! Oh why the panic in your breast? Had cost thee many a weary nibble. Still thou art blessed, compared with me! For more of Burns' poetry and more English translations see the Burns Country website. Another of my personal favourites is "To A Louse." No preamble or discussion required. The ordinary idea which we all have before we become Christians is this. We take as a starting point our ordinary self with its various desires and interests. We then admit that something else – call it ‘morality’ or ‘decent behaviour’, or ‘the good of society’ – has claims on this self: claims which interfere with its own desires. What we mean by ‘being good’ is giving in to these claims. Some of the things the ordinary self wanted to do turn out to be what we call ‘wrong’: well, we must give them up. Other things, which the self did not want to do, turn out to be what we call ‘right’: well, we shall have to do them. But we are hoping all the time that when all the demands have been met, the poor natural self will still have some chance, and some time, to get on with its own life and do what it likes. In fact, we are very like an honest man paying his taxes. He pays them all right, but he does hope that there will be enough left over for him to live on. Because we are still taking our natural self as the starting point. . . . It is like that here. The terrible thing, the almost impossible thing, is to hand over your whole self – all your wishes and precautions – to Christ. But it is far easier than what we are all trying to do instead. For what we are trying to do is to remain what we call ‘ourselves’, to keep personal happiness as our great aim in life, and yet at the same time be ‘good’. We are all trying to let our mind and heart go their own way – centred on money or pleasure or ambition – and hoping, in spite of this to behave honestly and chastely and humbly. And that is exactly what Christ warned us you could not do. As He said, a thistle cannot produce figs. If I am a field that contains nothing but grass-seed, I cannot produce wheat. Cutting the grass may keep it short: but I shall still produce grass and no wheat. If I want to produce wheat, the change must go deeper than the surface. I must be ploughed up and re-sown. All this needs is some comments. me do so, so that I can earn a living, so that I can help and serve my neighbor. He is suggesting that every person has a place, either of their own choosing or by virtue of having that role thrust upon them, and we seek to fulfill that role to the best of our abilities. In this way we praise God with our vocation. But you might ask, "What of the mundane interruptions of life and the things which seem so unrelated to my vocation?" Dietrich Bonhoeffer had this to say about helpfulness and interruptions. 1 Martin Luther, “Sermon in the Castle Church at Weimar” (25 October 1522, Saturday after the Eighteenth Sunday after Trinity), in D. Martin Luthers Werke: Kritische Gesamtausgabe, 60 vols. (Weimar: Herman Böhlaus Nachfolger, 1883–1980) 10/3:382. 2 Dietrich Bonhoeffer Life Together, Harper, New York: 1954. 3 Henri J. M. Nouwen, Reaching Out: The Three Movements of the Spiritual Life (Toronto: Doubleday, 1975), 52, 53. When you listen to and read one thinker, you become a clone; two thinkers, you become confused; ten thinkers, you’ll begin developing your own voice; two or three hundred thinkers, you become wise and develop your voice. "Reform and Resurge Conference," 2006. I pray that we might listen to the words of many and, with appropriate reverence for our God, discern the wisdom to which He calls us.
. . . let no man . . . think or maintain, that a man can search too far or be too well studied in the book of God’s word, or in the book of God’s works; divinity or philosophy; but rather let men endeavour an endless progress or proficience in both. These words were written by Francis Bacon in his book Advancement of Learning in 1605. We might put it differently today and say that one can study both theology and philosophy or theology and science. The study of God's word in the Bible and God's works in the world are both legitimate pursuits. We need not fear finding the truth. The Creator of the universe knows the minute details of genetics, physics, mathematics, sociology, philosophy, and anthropology. Nothing that we can learn will surprise Him or call into question His word in the Bible. We humans may need to change our interpretations of the Bible or our theology as we learn more about the universe He has created; and this is how things should be. Reading one helps us with the reading of the other. Notice his use of the word "Creator." Darwin was not afraid of searching for scientific answers and searching for Christian answers. Neither do we need to fear science nor fear theology. God is Lord over both.